Cruel Valentine’s Pasties of the Month Subscription Boxes are delivered monthly to your door, and each one features one unique pair of pasties in your size, a sample of pastie tape, and a different special gift each month. 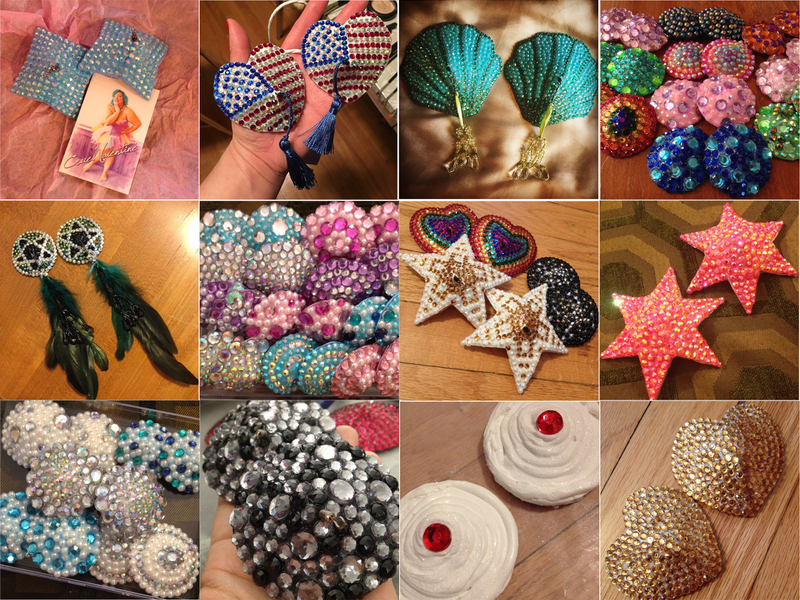 Each pair of pasties is created in a fun shape and style, with high shine resin and acrylic rhinestones to give you maximum sparkle both onstage and off, as well as other fun materials and textures. These pasties also feature a sturdy buckram backing, to guarantee optimal adhesion and a long life for your pasties, even for the most active and adventurous of wearers. 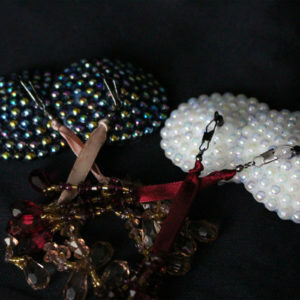 Some months will feature tasseled pasties, some will feature standard pairs without tassel mounts. These boxes make a great gift for any burlesque enthusiast, so feel free to buy a subscription for a friend! Just make sure you enter the correct shipping information when doing so. If the recipient’s mailing address should change during the subscription period, please send (or have them send) updated shipping information to info@CruelValentine.com so your next box gets to the correct place! Subscription boxes are billed as a one time, upfront payment, with a one time shipping charge. If you would like to be considered for a monthly billing plan, please contact info@CruelValentine.com. Please note that this option is only available to professional burlesque performers or students with proof of class registration, and will be considered on a case by case basis. If you opt for custom sizing, you’ll be contacted for your measurements upon receipt of your order. 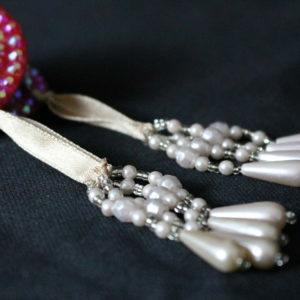 Free shipping on all subscription box orders! Hurrah! Shipments will go out monthly no later than the 15th of each month via USPS for orders placed before the 5th of that month. Those who place orders later than the 5th will receive their first box the following month. Your order must be placed by the 5th of the month if you would like to receive that month’s box, otherwise, your boxes will start coming the following month. That said, special requests for rush orders will be accommodated if at all possible. For consideration, please contact Cruel Valentine before placing your order, and your request will be accommodated if at all possible.